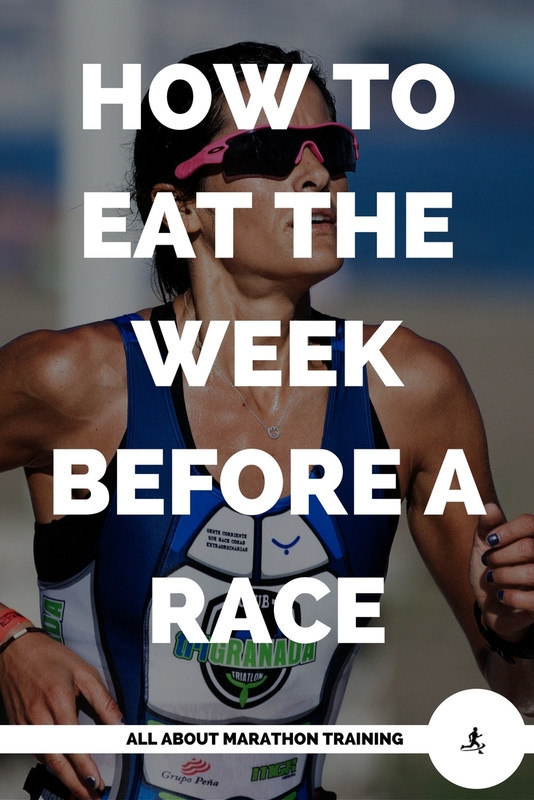 Keep eating a balanced diet the week before marathon. Don’t try any new diets or foods. Be sure to eat the recommended amounts of proteins, carbs and fats and be eating lots of fruits and vegetables, those complex carbohydrates. Drink at least 6-8 glasses of water per day. The more the better. Reduce your mileage as is planned in your training program. 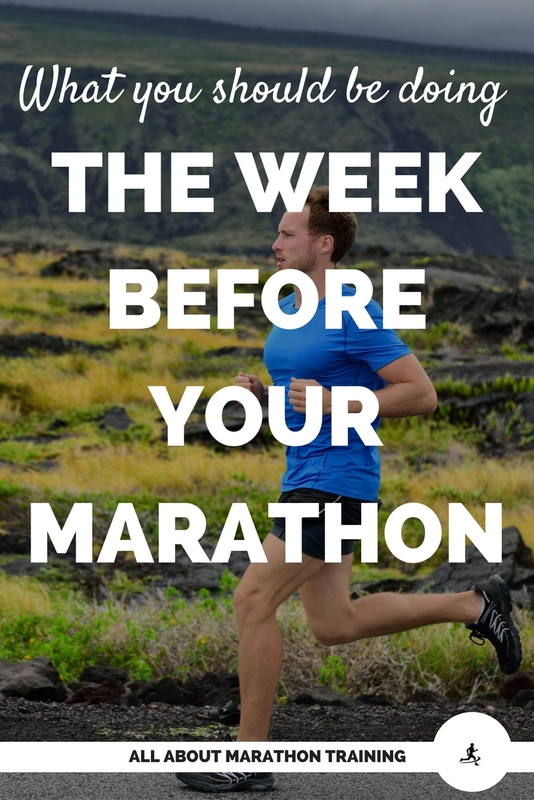 This week before marathon is all about relaxing, rejuvenating, carbo-loading and looking forward to a great race. 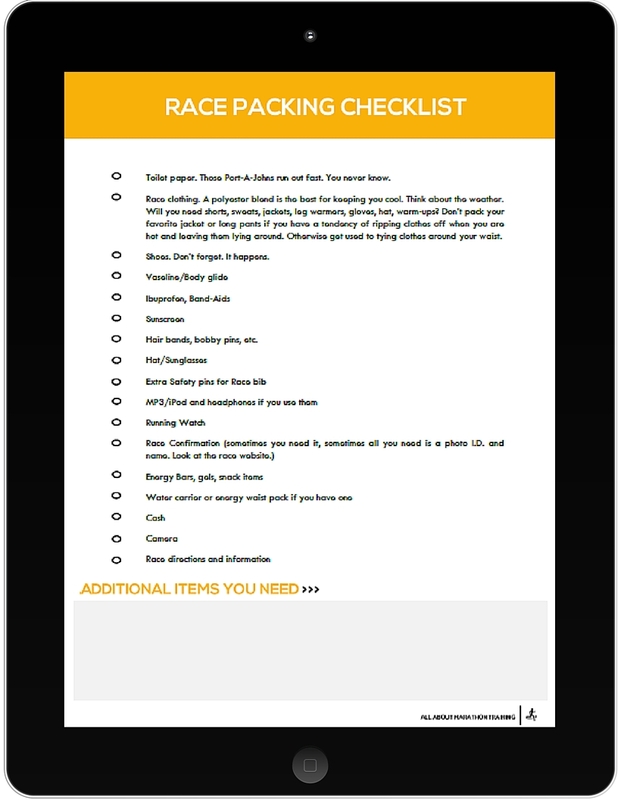 Race Packing Checklist - Download me! 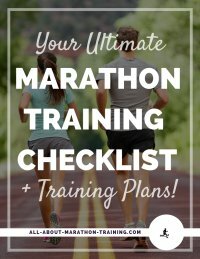 If you running an out of town race, start packing now - or at least a week before marathon. You don’t want to be frantically running around at the last minute next week trying to get everything together. You need to stay focused then and not be feeling overwhelmed. Now is the time to get things together. Even if you are not going out of town you will still need some items for the race so start going after them…now! Toilet paper. Those Port-A-Johns run out fast. You never know. Race clothing. A polyester blend is the best for keeping you cool. Think about the weather. Will you need shorts, sweats, jackets, leg warmers, gloves, hat, warm-ups? Don’t pack your favorite jacket or long pants if you have a tendency of ripping clothes off when you are hot and leaving them lying around. Otherwise get used to tying clothes around your waist. Shoes. Don’t forget. It happens. Hair bands, bobby pins, etc. Look at the race course map. It would be a good idea to do this before you start training so that you are more aware of how to train but if you haven't check it out now so you are not too surprised come race day. In particular, look at what the elevation is like and where the aid stations are placed. Get your Running Playlist in Order: If you are one of those runners who need music while running then make sure to get your perfect playlist together before the race! Put songs in order from favorite to most favorite. That way, towards the end of the race you will get to listen to your absolute favorite songs. Added motivation! Also, podcasts and audiobooks make for great listens. How many songs should you have on your playlist? Well if you run about 9 minutes per mile for 13.1 miles, and an average song is 3 minutes long then you will need about 40 songs. Double that for the marathon. This number will obviously change depending on your pace and length of song so plan accordingly. Keep your mind filled with positive thoughts. Nothing weighs you down more than negative thoughts and for that matter, negative people. 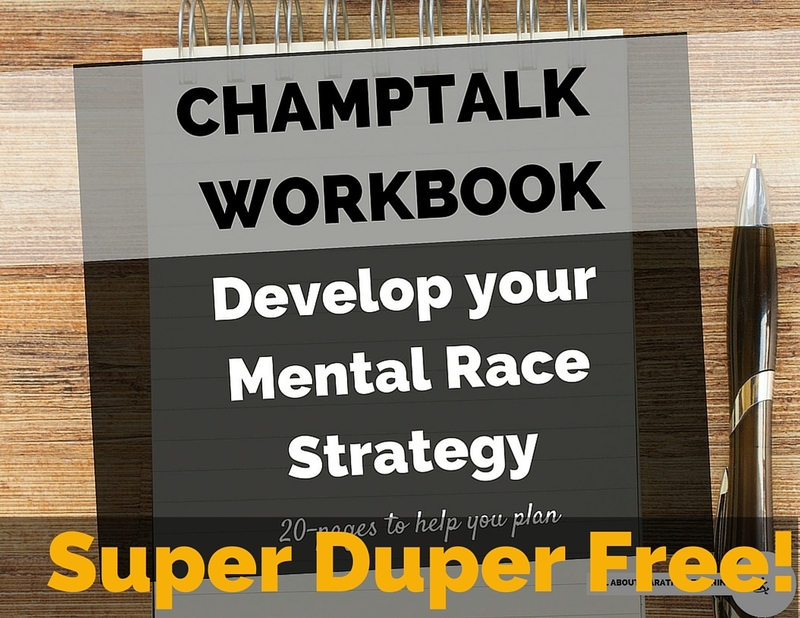 If you haven't done so yet, plan out your mental race strategy using our guide, CHAMPTALK Workbook. You can download it here. 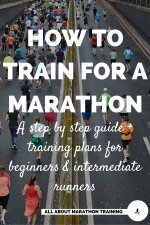 It will help you develop a mantra, teach you how to deal with negative thoughts during a race, how to handle pain during the later miles, and work through any race details. Check the weather forecast to be sure that you have packed appropriate running clothes. Become familiar with the race directions. Know where it starts and finishes so that you can meet your family and friends at a pre-determined spot. Know what times shuttles run to the starting line whether it’s from your hotel or a parking lot. You don’t want to be left behind. Also, be sure to check out our carbo-loading guide and download your FREE carbo-loading package which contains a list of high carb foods to eat, a sample menu plan, and a space to plan your carbo-loading menu. Stay away from fatty, fried foods, and dairy products such as milk and cheese. These will have a negative effect on your running making you feel sluggish. Try to avoid eating large amounts of protein. You still need to be getting your recommended daily amount – approximately 50 grams per day depending on your body size but focus on carbohydrates. 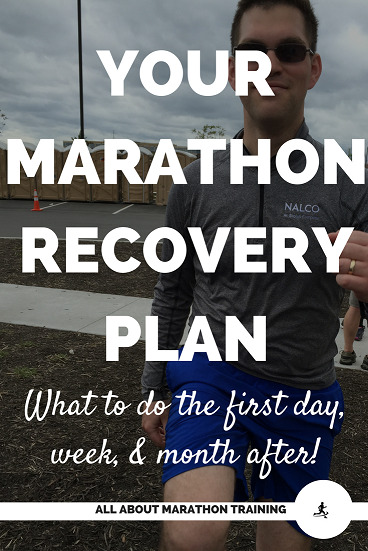 Protein will take an important role in your recovery after the marathon. Drinking fluids, most importantly water, is crucial! Also, drink 8-16 ounces of an electrolyte drink. If you are traveling to the half marathon destination by plane make sure that you are keeping your water close to you as those high altitudes really cause you to become dehydrated fast. It is okay to go on a short walk to loosen up a bit. After you are warmed up, get some stretching in and clear your mind. Pick up your registration packet. Some races will allow you to pick up your race packet on the morning of a race however some don’t so figure it out. Find out when you can pick it up. This registration packet will include your race bib, to be pinned on your t-shirt and your time chip, which will be tied to your shoes. 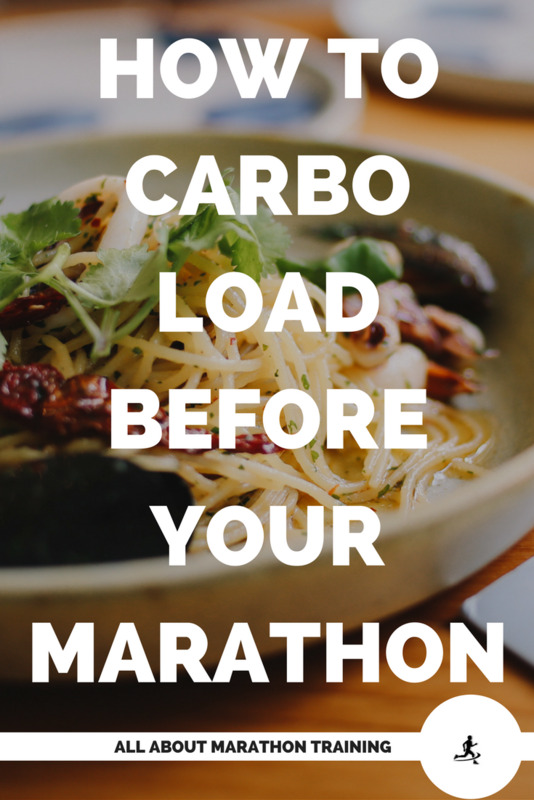 Eat a pre-race meal high in carbs. A lot of races will offer a spaghetti dinner the night before a race. This is a great opportunity to meet up with some runners and get your carbohydrate fix. If you are making your own pasta or rice meal, go easy on the sauces. Most sauces contain a lot of fat (think creamy white Alfredo sauce…not a good idea). Make sure that you have everything laid out and ready to go. Shirt, bottoms, socks, shoes, jacket, energy bar, watch, hair ties, etc. Remember be prepared! Pin your race bib onto your shirt. Those safety pins that were on your packing list…yes, you may need them if you did not get any in your registration bag. If you have a race timing chip, tie it onto your shoes. A good tip is to weave your shoe laces through the holes of the chip so that you do not lose it while you are running. (Some races make you pay for lost or unreturned time chips.) A lot of races now have chips in their bibs so you may not receive one. Set your alarm! Have a backup plan in case it does not go off. Maybe somebody else can wake you up or call you. Don’t think it won’t happen to you. There have been more than a couple people late for a race. Get a good night’s sleep. Or at least the best that you can. Many runners experience pre-race excitement that can keep them up to all hours of the night. Try and clear you mind, keep your eyes close and at least let your body relax even if your mind wont.